The REAL project was well represented at the jointly held 14th Congress of the Pan African Archaeological Association for Prehistory and Related Studies and the 22nd Biennial Meeting of the Society of Africanist Archaeologists which took place 14th-18th of July at the University of the Witwatersrand, Johannesburg, South Africa. Nik Petek presented on Gifts, Feasts, and Social Capital: An Alternative Way to Social Stratification at Shanga, Kenya, and displayed a poster titled Landscape and Population Resilience in the Lake Baringo Basin, Kenya, AD 800-1750. 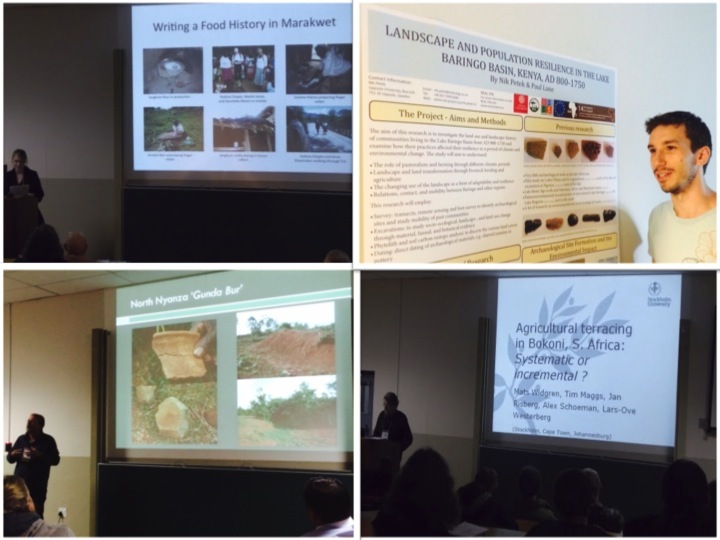 Anna Shoemaker presented on The Archaeobotany of Crops and Crop Processing in Marakwet: Towards a History of Food. Mats Widgren presented Agricultural Terracing in Bokoni as Systematic or Incremental Change: An Exploratory Survey of Ancient Fields in Mpumalanga Province, South Africa and co-authored Spatial Organisation in Bokoni: Agricultural Intensification in Mpumalanga Province, South Africa. Paul Lane presented two talks, including Enduring Dung and Persistent Paths: New Approaches to the Archaeology of East African Pastoralism and Migrations, Dissonance, and Unsettled History: The Case of the Kenya Luo. The Oxford Handbook of African Archaeology co-edited by Peter Mitchell and Paul Lane was also awarded the SAfA Best Book in African Archaeology 2014 award, congratulations Professor Lane!